Inder Loves Folk Art: Little bathing beauty. I signed both of my kids up for swim lessons this summer, starting next weekend! I am a little worried about how Joe will do, since he tends to be resistant and stubborn cautious and hesitant about trying new things. But I know Maggie will love it! That girl has no fear! And both of my children love the water and spend hours playing in our kiddy pool in the backyard almost every day in hot weather. Joe already has a pair of swim trunks which I got in a box of hand-me-downs. And I could've sworn we had multiple handed-down swim suits for Maggie, but when push came to shove, I couldn't find one anywhere! So of course, I had to make one. No, really, I really did look for the missing suits! I actually went through boxes! I wasn't just looking for an excuse to sew one. I knew exactly which swimsuit I wanted to make for Maggie. Sewpony's adorable Cosi Suit. First, I love Sewpony's aesthetic. She clearly shares my love of all things 1970s and her patterns have the sweetest retro vibe. I made her "Little Betty Top" for Maggie and loved the pattern drafting and instructions (I need to make some summer Betties!). And the Cosi is currently on a blog tour, and if there is one unchanging reality in this uncertain world, it is that I am a sucker for a good blog tour. By the time I saw Rachel's post at Stitched Together it was a foregone conclusion. So yeah, twist my arm. Although I have been on a fabric and pattern diet recently, and have diligently been using the materials I have on hand for the past half-dozen projects, I slipped hard and bought the pattern and a yard of emerald green spandex and notions. As far as slippage goes, it wasn't too bad - hey, I made it out of the fabric store without buying a bunch of other things! Yay me? I think I was subliminally influenced by the saleslady's awesome emerald green hair. There were lots of beautiful colors, but I just had to have this one. When I brought it to the counter, I realized it perfectly matched her hair! The fabric is shiny and a little sparkly. 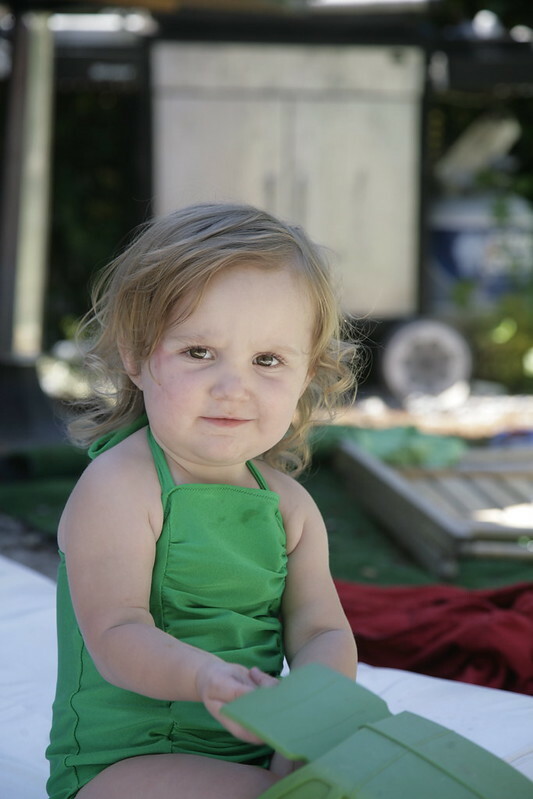 "Little Serpent," "Mermaid," and "Kermit" are all descriptions that I've heard since putting Maggie in her new suit. But hey, emerald green is a great color on my Mags! I've never sewn a swimsuit before. Swimsuits are one of those things: they just seem a little intimidating. I think it's all that shiny, slippery, super stretchy fabric. But for the past couple years, it seems that everyone in blogland has been sewing their own bathing suits, and all I hear is how easy and forgiving they are! So I decided to just dive in. Since I was working with a solid color, I chose view A, figuring that the ruched center panel would provide a cute detail for the plain fabric. Based on Maggie's measurements, obtained while chasing Maggie around the house (and thus probably not precise), I cut out a size 18 months, which turned out to be on the big side (dang my girl is tiny!). I think the ruching would be cuter if the fit on the suit was a little tighter. As it is, the suit is a bit baggy and the ruching is poofy. But it will be fine for this weekend's lessons. Why the skeptical face, Maggie? Baby swimsuits require so little fabric. It's insane. I needed some length for the ruched panel, but I still have a piece 53" by a yard left. I have enough leftover to make myself a swimsuit. Or two! I considered this to be something of a trial version (a muslin if you will), so I sewed it entirely on my sewing machine, using zig-zag stitch and no walking foot or any special tools (except a ballpoint needle). I just wanted to see how it all went together, and the sewing machine gives a bit more control. As a result, the inside of the suit is hella messy, but hey, who cares? Spandex doesn't fray, so it isn't going to get any worse. I am here to say, you can totally make this suit on a sewing machine. No serger required. I am planning to make Maggie a second suit, this time with nicer finishing, and hopefully with a better fit. It really is a fast and easy project, just as everyone says. The hardest part of sewing the suit was applying the elastic to the legholes, stretching it as you sew. Mine is not perfect, but having done it once, I think I will do a better job next time. I have always heard it's good to stretch it more in the back and less in the front for a good fit (this is true for undies too), but this is surprisingly difficult to control while you are chugging away at a sewing machine with children hanging off of you. Still, as time goes on and I sew with knits more frequently, I have developed a better "feel" for this and I think it will go better next time. 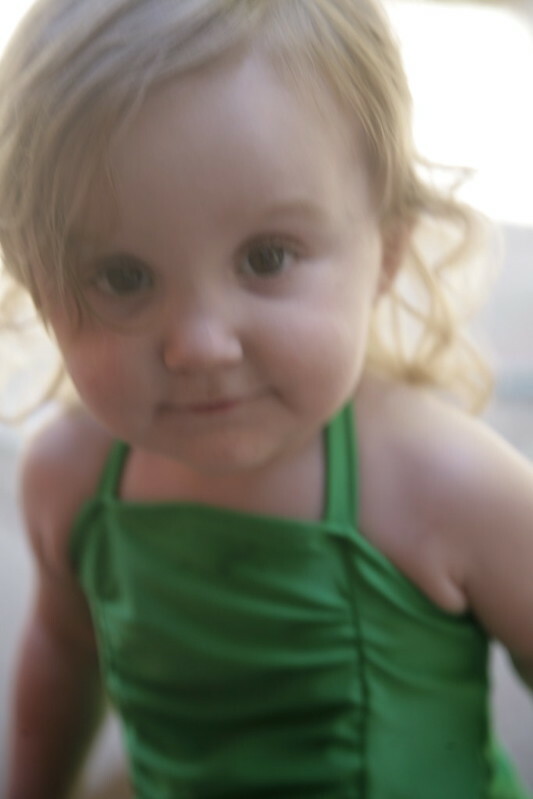 I had to finish up with this blurry but very sweet photo of my lovely Maggie McGee. Wish me luck with swim lessons! Nice job on the swimsuit! I love that shade of green! I really think that if the suit actually fit, the ruching would be stretched width-wise and look much better. If I had to do it over, I wouldn't change the ruching,but I would take the suit in at the sides to stretch that panel more. I was really afraid of ruining the suit with the serger blade trying to finish gathered edges of the ruching inside, so I decided I'd just do the whole thing on my machine. Plus, you know, I don't have emerald green serger thread! Love this on Miss Maggie - it is the perfect colour for her. I hope the swimming lessons go well for both of them! I've been using my sewing machine for knits a fair bit lately - I use just the overlocker for the kids' things, but use the machine and the overlocker for mine - not so fast, but better results. This cossie is on my list for summer! Thank you Justine!! For t-shirts for me, I do use just the serger for major seams, I just like the results better - less stretched, wavy seams. But the longer I sew with knits, the better I get at making my sewing machine work, even without special tools like the walking foot. So much of it is getting a "feel" for knits and just letting the machine do its thing - I can't explain it! This is so cute and looks adorable on her! I LOVE that beautiful emerald green. Thank you Mikhaela! It is such a nice color, she does look like a little mermaid! Well that is adorable! All these swimming suits are making me want to make one! Maybe next summer, as I'm usually so slow trying new patterns. At least by then I can look back at all these lovely swimsuit posts and gather lots of good advice. Nice to know that it is possible to do on the machine, though. My (mom's) serger just broke and I'm awaiting a call from the repair shop to see if it's fixable. Cute!! Hopefully the suit will fit for a few months to come too. I love the colour! That green really suits Maggie. She is adorable! I think you've convinced me to make my little girl (just about to turn 2 and also tiny!) a bathing suit for when summer rolls around here - still a good 3 months away at least before it will be warm enough. Eeeek.,Those little legs! So cute!! the swimsuit looks great. the colour is awesome and the style of this pattern is perfect for a solid colour fabric. Well done! How did I miss this post?? Such a cute little swimsuit! And that color really is beautiful and suits her so well!